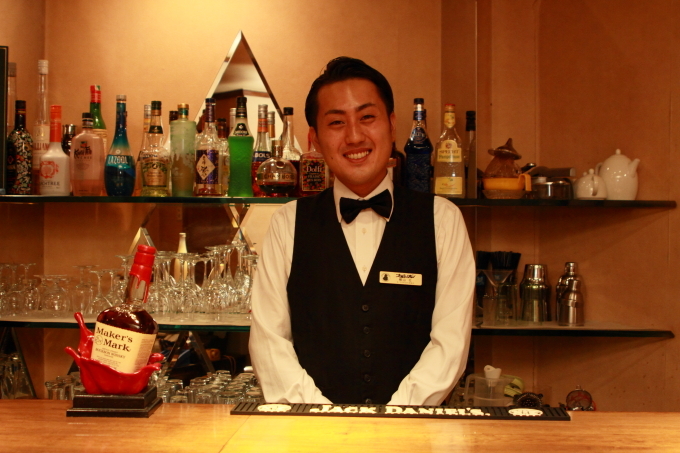 This time, Yokoyama, a bartender at PEARL BAR in Kure city, Hiroshima is going to make a cocktail. 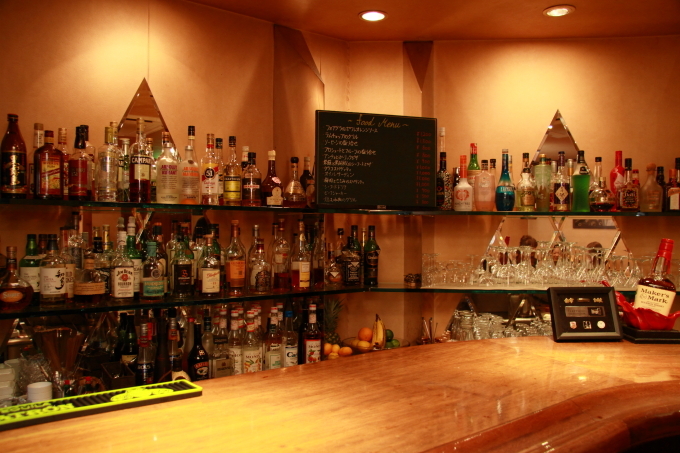 The cocktail today is for Noriko who is a regular customer of PEARL BAR. 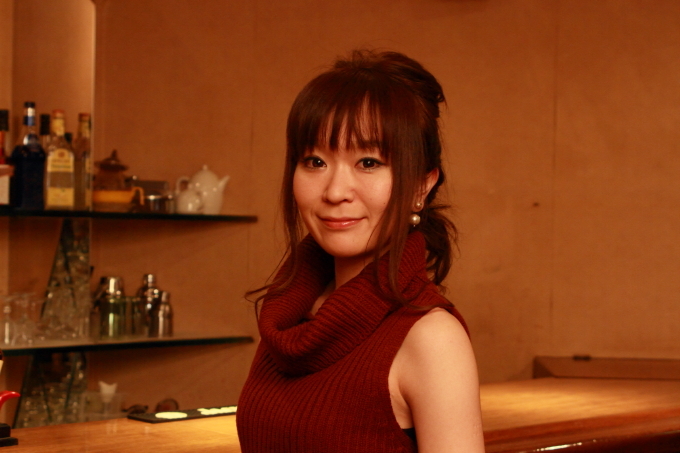 Noriko is a 28 year old woman who lives in Kure city and she works for a company. The base he chooses for the cocktail is the liqueur, ‘Lychee’. These ingredients are what Yokoyama is going to use. 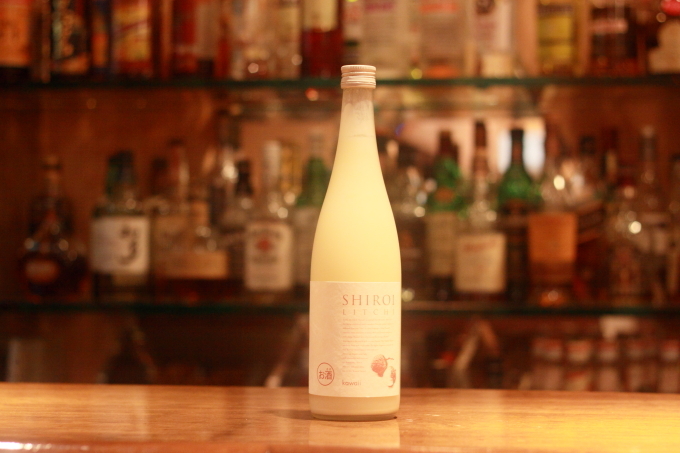 I’m going to make a smart looking cocktail by using some sparkling wine as Noriko is a mature looking lady. 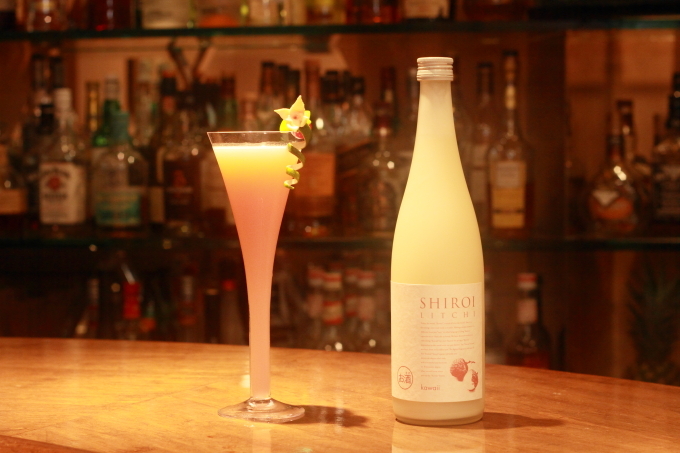 The lychee liqueur is very good quality, so I thought about a simple cocktail that utilizes its delicious flavour. 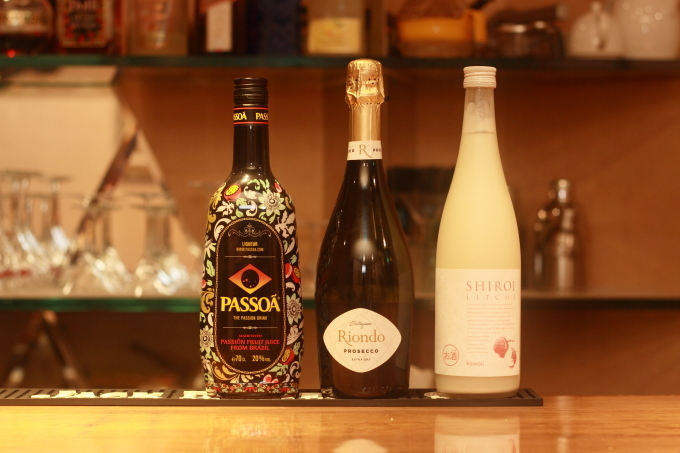 This is a balanced cocktail that goes with anything and the sparkling wine gives it more of an aroma. I’ll make the colour of the cocktail vary as it goes down the glass to match Noriko’s top. Put 90ml of the lychee liqueur and 45ml of Passoa into a shaker. 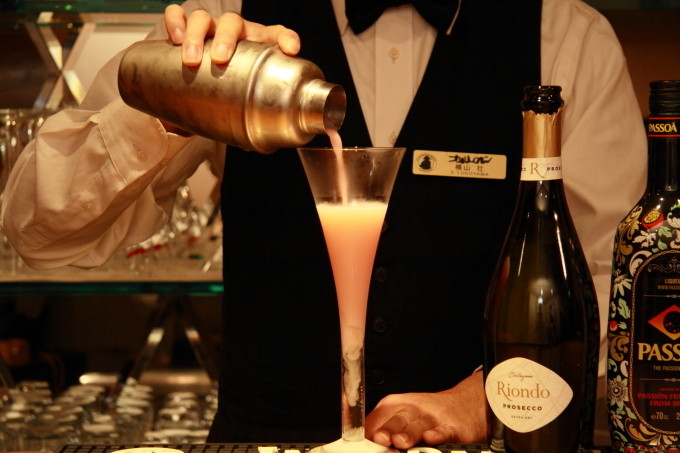 Pour 45ml of the Italian dry sparkling wine Spumante into a chilled long glass. Add some ice in the shaker and shake it. Pour the drink into the glass that has sparkling wine in it already and it’s complete. 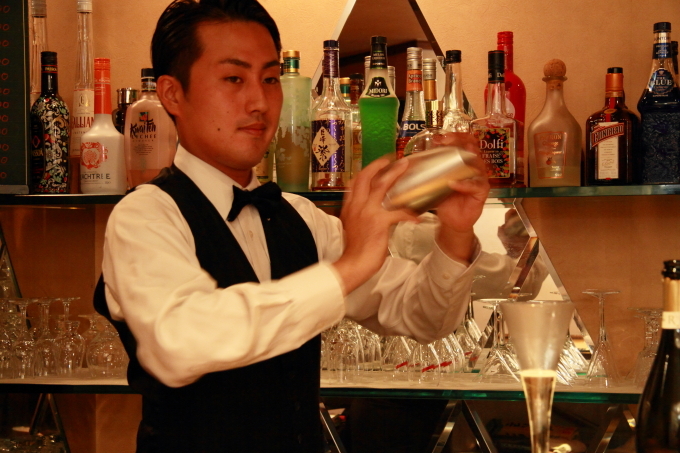 He serves Noriko the completed cocktail. I’m not a strong drinker, but this is creamy and easy to drink. You can smell the lychee aroma even before drinking it and it has a strawberry like sweetness to it, so women would feel nice drinking this. It’s easy to drink, so I could accidently drink more than I can. 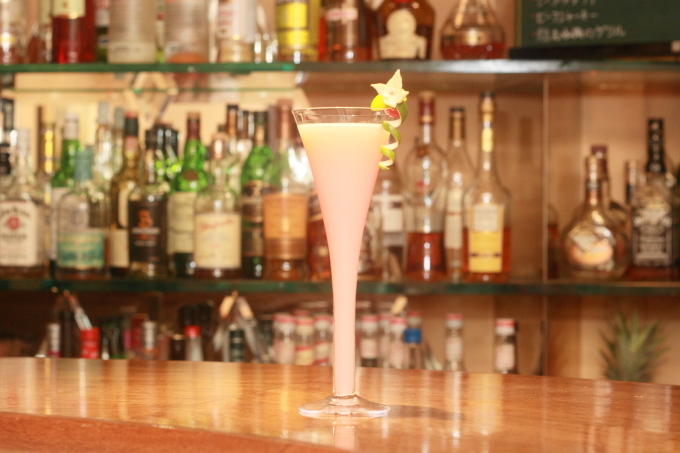 Well, that’s how this cocktail ‘Setsuka’ was born, Yokoyama the bartender used the lychee liqueur to make something for Noriko. Thank you very much Yokoyama and Noriko.